The Commonwealth Heads of Government Meetings provide a chance to air the problem of frozen pensions, not necessarily at the meeting itself but certainly on the sidelines of the meeting and in the social media space around it. This year’s meeting was no exception. Publicity and support comes in a number of interesting ways. 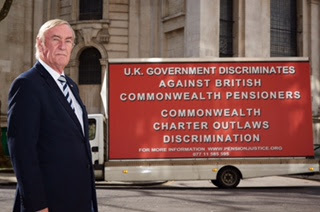 One example was the two AdVans driving around with the message below, while John Duffy of the International Consortium of British Pensioners, pictured, was busy attending forums and generally raising awareness among the various delegations. A particularly welcome boost to the cause came from Richard Branson who dwelt at some length on his website about the issue. Some extracts from his recent post (19 April) provide a good summary of the situation and indicate what some of his 3 million followers may be reading. The policy means almost half of all pensioners living overseas do not receive increases in their pension payments and their pension remains at the same level for their entire lives. It’s an uneven policy as British pensioners in some countries get the increased payments whereas others are frozen. More than 95 per cent of those affected live in Commonwealth countries, most in Australia, Canada, South Africa and New Zealand, but also India, Pakistan, Bangladesh, many Caribbean islands and all African countries, except Mauritius where pensions are indexed. The system seems very unfair. A pensioner aged 90 living on a frozen pension would receive £41.25 per week, whereas a pensioner retiring today would get £155 per week. The different amounts are based on where they live and nothing else. The International Consortium of British Pensioners – led by Sheila Telford – is working to get the government to reconsider their policy. They have the support of a number of MPs and are hoping a solution can be found to alleviate the hardship faced by many. The cost to solve the problem would be just 0.7 per cent of the pensions budget in 2017. It is good to see that Sir Richard is supporting the cause despite not being in such dire straits that he feels the need to fall back on the apparently meagre resources of the UK government in his tropical hideaway or wherever. He maintains that he will never retire and will not be claiming a UK pension. ‘Full’ uprating could well prompt back-claims for the loss of full pension up to the date the new policy becomes effective, something the government doesn’t want to contemplate. To the extent that the new policy would remove the disincentive to emigrate from UK the government would save £3,800 per person pa. This is a government figure and obviously applies equally to current frozen pensioners. It is procedurally simple to implement. While these arguments are understood, it would be particularly galling for the very old trying to get by on less than one third of the current pension. Frozen pensioners will no doubt have mixed feelings about efforts to ensure UK expat pensioners in the EU do not lose their rights to the annual increases on Brexit. The power of the media has been displayed vividly in recent days with regard to the shocking treatment of commonwealth immigrants by the home office. These same people will now be recognised as having full rights to remain in the UK along with rights to benefits,NHS trearment and state pensions .The UK government have been acutely embarassed by press and TV coverage of the Windrush affair and has acted quickly to right the wrongs perpetrated on these people.